Share "Tips for Organizing your Attic and Keeping it in Tip Top Shape"
If you are like most people, this is time of year when you head on up to the attic to retrieve your holiday decorations. However, you might be unfortunate enough to discover that your way is blocked and you can’t go any further; or what you’re looking for is scattered amongst countless open boxes, bags, and other debris you’ve forgotten you’ve even had. If this is the case, then a few organizing tips could be just the thing. 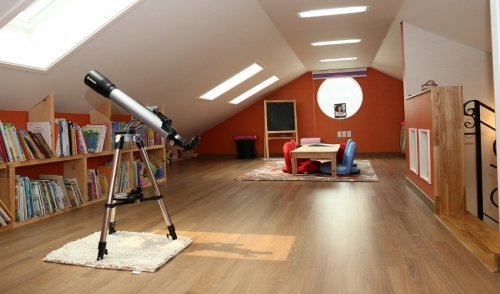 Getting your attic under control is not as daunting a task as it may seem. It is a job that can be done in small batches over the course of just a few weekends. If you need it done sooner, then the help of a few friends or family an all-out assault can be accomplished in just one day. In either situation, the plan of attack is the same. First and foremost, you have to be prepared to make some tough decisions. But don’t worry; it gets easier as you go. Once you are ready to start hauling things down from the attic, whether it’s a couple boxes at a time or in large batches, the first thing you should do is separate what you bring down into the following four piles. Things you want to keep, things you think you could sell, items you would like to donate, and stuff you’re willing to just throw away. These are the things you can’t part with, such as family heirlooms, important papers, etc. Protect these and other things that are delicate or valuable. For example: waterproof containers are recommended for important papers and photos in case there is ever a leak in your attic; sturdy plastic storage bins will prevent your valuables from being banged around while moving or damaged by rodents and other pests. Once separated, keep these items downstairs with you so that you won’t forget about them. Advertise in your local paper, put up a list at work if it’s allowed, hold a garage sale, or use the Internet and turn these items into cash. What you are unable to sell can be donated. This stuff certainly shouldn’t go back up in the attic. If possible, take it directly to the trunk of your car as you organize. Be sure to only use cardboard boxes or bags for these, not your expensive storage bins. Also, don’t forget the tax advantages of donating your items. Take inventory and make a list of the items that you have donated. This pile may end up growing larger than you thought it would. These could be the things that you had set aside because you might have needed them someday, or things that have been broken --even some things that will leave you scratching your head wondering why they were even up there in the first place. Regardless, these things should head right for the curb, without looking back. Take the opportunity to clean the space. Sweep up and remove any trash or debris that is left behind. Next, survey the available area. Is there a corner best suited for hanging items like ladders, fishing poles, etc.? Where would shelving fit to make the best use of the space? Once you’ve packed things back into the proper storage containers, try to organize sections of the attic for different categories of items. The things accessed the least often would logically be placed the furthest from the attic entry. Remember to make the most of plastic storage bins and stack them; labeled in such a way as to clearly display the category of the items and a list of what’s inside. That way, you can just read the label instead of digging through a stack of storage bins. If you have the luxury of space, store holiday items in separate areas from each other. Even better -- try to use the holiday colors to your advantage. For example: Red/green bins and boxes for Christmas, orange/black for Halloween, or purple/pastels for Easter. Consider using garment bags for clothing items and install rods or hooks to hang them on. Standing shelving units are perfect for storing smaller sized boxes. Consider using clear boxes so that you know what’s inside without having to pull the box from the shelf. Place the shelving along the outer walls and leave the center of the attic open. For bulky items, cover them with old sheets, blankets, or drop cloths. When you are finished, you should be able to move around and find what you need a lot more easily and safely. You will have de-cluttered your attic, cleared up some extra storage space, donated to people in need, and maybe even made a little extra money. For suggestions on what type of shelving, storage containers, racks and hanging accessories would work best for you, stop in and ask our helpful staff and we’ll be happy to answer all of your questions.